I don't know about you, but cherries are one of my favorite summer treats. I literally eat them like candy. Luckily they are better for me than that! Cherries are an excellent source of potassium and manganese. It is a very good source of magnesium and copper. Good amounts of iron and phosphorous are found in cherries. Other minerals present in cheries include calcium and potassium, which are present only in trace amounts. Vitamin Content: Cherry is an excellent source of vitamin c, vitamin k and is a very good source of thiamin, riboflavin, vitamin B6 and pantothenic acid. It also contains traces of niacin, folate and vitamin A.
Calorie Content: 100g of cherries contain 63 calories. It is also a good source of dietary fiber. This food is primarily made up of water and carbohydrates ad is low in saturated fat, cholesterol and sodium. Health Benefits of Cherries: Cherry can reduce the pain of arthritis, gout and headaches. Cherry contains anthocyanin, a red pigment, which acts as an antioxidant. The plant pigment along with vitamin C strengthens collagen. Cherry juice contains melatonin, which is important for the function of the immune system. Cherries are used as a sedative in nausea and vomiting. Wild cherry bark is an important cough remedy. Cherry is also beneficial in treating bronchitis, asthma and chronic diarrhea. It has been found that cherries can reduce the risk of heart attack and the risk of cancer by fifty percent. 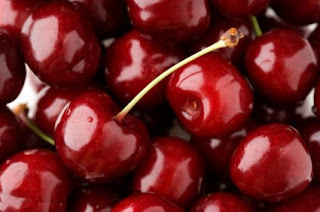 For more information on the health benefits of cherries along with some great recipes visit Cherries.